This document introduces the Google Apps integration as noted in the Canvas Production Release Notes (2017-01-07). The Google Apps LTI can be configured manually by users who have permission to add and edit LTI tools. When enabled, the Google LTI adds functionality to multiple areas in Canvas courses. Canvas has improved its integration with Google Apps making it easier for instructors to include collaborations, content sharing, engaging course content, and assignment distribution directly within Canvas. The integration also makes it easy for students to collaborate with instructors and fellow students on individual or group assignments. Google Apps is an external app (LTI) available to institutions with Google Apps for education. However, anyone with a Google account can use this integration. The Google Apps LTI supports Google Drive in Canvas and can be enabled at the account, sub-account, or course level in a Canvas production environment. The LTI must be configured manually by users who have permission to add and edit LTI tools. United States: Users can generate their own key and secret to install the LTI tool through the EduAppCenter Google app page. Instructors in Free-for-Teacher accounts can add the LTI to individual courses. Worldwide Regions: Users should contact their Canvas Customer Success Manager (CSM) for region-specific configuration credentials. Google is not currently available for instructors in Free-for-Teacher accounts. Note: Once the Google Apps LTI is added to a production environment, the institution's beta environment will adapt the settings from the production environment on the next beta refresh, which will allow users to test the integration in beta. However, please note that the integration is still subject to all feature limitations that may exist in the beta environment. This integration is not affiliated with the current Google Drive web service in Canvas. If instructors and students already have Google Drive set up as a web service, they will still have to authenticate through the LTI. The Google Drive web service should be disabled by a Canvas admin in the Account Settings page. Retaining the web service may cause confusion for students, who would otherwise see tabs for both Google Drive and Google Doc when uploading a file submission. Documentation for the Google Apps LTI and related Google Drive features can be found using the Google Drive tag in the Canvas Guides. Account sharing permissions can prevent sharing outside of an institution’s domain. Google admins can change the sharing permissions to allow documents to be shared outside the institution. This feature may affect institutions with trust accounts. Document permissions can prevent files from previewing in a course. Users should ensure that permissions are set correctly for a document before sharing it with others in Canvas. Google authentication is only managed when adding Google as a third-party authentication service in Canvas. The LTI integration does not support single sign-on authentication. Canvas admins can set up Google as an authentication method so users can sign into Canvas using their Google credentials. However, the LTI integration itself does not support single sign-on (SSO) authentication. After users log in to Canvas using Google, they will also have to authenticate into the Google LTI. The Google LTI adds a link to the user’s Google Drive in the Course Navigation Menu. The name of the link aligns with the name added as part of the Google LTI (most commonly Google Drive). Users can authorize the Google Apps LTI to view their Google Drive account. If authorization to Google Drive is not successful the first time, authorize the application again. After logging in to Google Drive, users can view everything in their My Drive folder. They can also open files in a new browser window and edit files directly. Items that are in the Shared with Me folder need to be added to the user's My Drive before those items can be viewed in Canvas. The Google Drive link does not automatically update content added to a user’s My Drive folder. To view the most recent content, users have to refresh their Google Drive page in Canvas. Files are displayed in alphabetical order. Users can only authenticate into one Google Drive account at a time. If users need to authenticate into Google Drive using a different account, users can open the User Settings page, remove the integration, and then authenticate again using the new Google Drive account. Note: The approved integration shows that the token has a short lifespan, but Canvas gives the app a refresh token that can be used to get new tokens when necessary. Users can still use the integration even if the expiration has passed. Instructors can create an online embedded assignment through an external tool. With the Google Apps external tool, this assignment type creates a view of the assignment file that acts as a template for a student’s assignment submission. Accepted assignment types are Google Docs, Spreadsheets, and Presentations. Rubrics can be added to external tool assignments, though the rubric must be added to the assignment before the assignment is set as an external tool assignment. Students can view the rubric in the assignment details page (accessed through their Grades page), and instructors can view the rubric in SpeedGrader. When students open the assignment, Google Drive will create a copy of the file in the student’s Google Drive folder for the course for each student’s submission. Depending on how the document is configured, they may not need to log in. The students can update the document per the assignment instructions and submit it without leaving the page. If students want to view the version of their cloud document submitted for the assignment, they can view the document in the assignment details page. Instructors view each student’s document copy in SpeedGrader for grading. Instructors can also continue to create regular file upload assignments. However, when instructor allows file uploads, students can view the Google Drive tab and upload files directly from Google Drive. Note: When the Google Apps LTI is enabled, this feature no longer requires students to set up Google Drive as a web service. If the web service is still enabled, students will view tabs for both Google Drive and Google Docs. SpeedGrader displays any uploaded file type that is supported like other Canvas assignments. Some files cannot be previewed in SpeedGrader and have to be downloaded for viewing. However, SpeedGrader does support previews for native Google file types. Users can create collaborations with documents, spreadsheets, or presentations. The creator can add individual users or groups from the course to participate in the collaboration. Collaborators can be added or removed at any time, but once a user is added to the collaboration, the user always has access to the collaboration in the user’s Google Drive folder. Collaborations require a name before they can be saved. Google Apps complements Canvas with an updated Collaborations page. The page design update is controlled by the External Collaborations Tool feature option, which can be enabled by a Canvas admin and must be enabled in the same location as the Google LTI app (course or account). 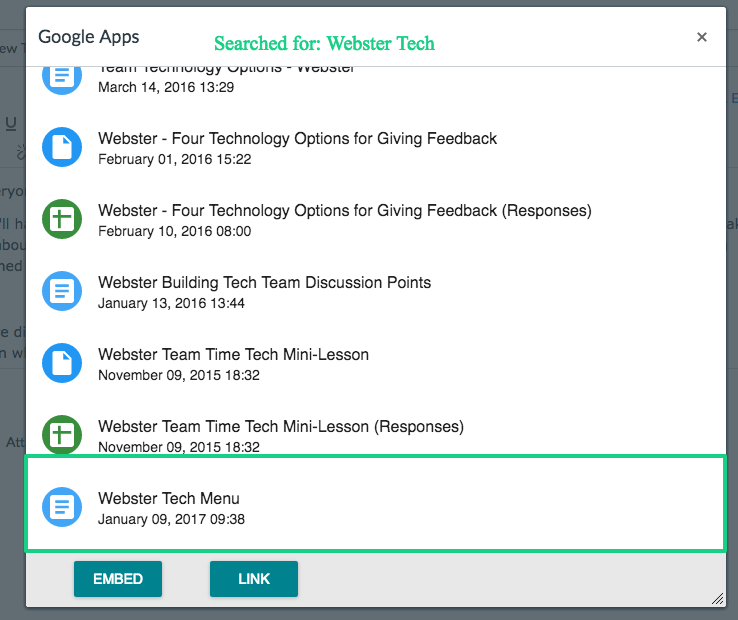 Enabling the External Collaborations Tool feature option removes the links to all existing collaborations and no longer allows users to create collaborations with the existing Google Drive option. To implement this feature, admins should set the feature option to allow so instructors can manage any existing collaborations. Instructors who want to retain existing collaborations should not enable the External Collaborations Tool feature option at the course level. Note: This feature option is not available in the beta environment. Users can access their Google Drive folder from the Course Navigation Menu. Google Apps does not display a folder directly in a user’s Files page. Like other uploaded files in Canvas, student submissions are copied to a student’s submissions folder in user files if the file was uploaded using the File Upload or Google Drive upload assignment options. However, cloud assignment submissions are copied into the student’s Google Drive folder. Google Apps displays as a Modules external tool. Instructors can add links to Google Drive documents as an external tool. Google Apps displays a Google Drive icon in the Rich Content Editor. The icon displays everything in a user’s Google Drive account and allows users to display documents as inline links or embed them directly. Students and teachers can view the icon anywhere they can access the Rich Content Editor, such as discussions and pages (as allowed). If the icon does not display directly in the tool bar, the icon is included in the More External Tools drop-down menu. Authentication through Google is not supported in the Canvas app. Collaborations are not supported in the Canvas app. Google files can be viewed in a mobile device by downloading the Google Drive mobile app. In cloud assignments, the students can view the assignment description but cannot view the cloud assignment. In the submission tab, students can view a link to access the assignment externally, though the link is not currently functional as it cannot connect the student to the student’s Google Drive account for online editing. Instructors who incorporate cloud assignments into their coursework should let students know that cloud assignment are not currently supported in the Canvas app. File upload submission types can accept files from the Google Drive mobile app per standard functionality. Modules can display external tools set to a Google document if students log in to their accounts. Cloud assignment submissions do not display in the app. For any other contrary behaviors in the production environment, users should submit a Canvas support case for assistance. Outstanding integrations! Thanks, Canvas Friends. Will there be a CanvasLive or webinar on it soon? Excellent news. The best part to me is the automatic creation of a copy of the file in a student's Google Drive folder and the ability to view those submissions in the SpeedGrader. Will there be a way to connect these to plagiarism detection systems like Turnitin and VeriCite? Have you seen this in action? I have setup our Beta site with the integration trying things out but I can't sign in as a student into the Beta environment to see what happens. Does it create a true copy as opposed to editing one copy? Does the teacher still "own" the copy and can collaborate with the student or does the ownership of the copy transfer to the student? Thanks. When students open the assignment, Google Drive will create a copy of the file in the student’s Google Drive folder for the course for each student’s submission. Depending on how the document is configured, they may not need to log in. The students can update the document per the assignment instructions and submit it without leaving the page. Instructors view each student’s document copy in SpeedGrader for grading. This was also my experience yesterday morning when I was trying out the Google LTI in our "test" environment. I had used two Google accounts (one to simulate a student and one to simulate an instructor), and after I made a simple template in my Google account as an instructor, I then signed in as a student, connected my other Google account, and then was able to make a copy of the instructor template file. It didn't change the instructor's template at all because the copy of it was not part of the other account. The ownership of the file created by the instructor in Google does not change/transfer to a student. It's a copy of the original. Also, instead of signing in as a student to your "beta" account, try masquerading as the student instead. I've found that sometimes when you're in "test" and "beta", it won't let you do things signed in as an actual student...but it will if you masquerade as the student (not using the "Student View" button in a course "Settings" page). Thanks Chris! This helps a lot. I was worried that the teacher would all of a sudden have 50 copies of their template in their Drive account to organize. I will try the tip for masquerading as a student. Ok, so the technical jargon is right at the ceiling of my abilities with this stuff. At the school I administer, we use Google as the primary login option and Google Apps extensively. Everyone clicks the Login with Google button on the login page (we also have this enabled on the mobile app thanks to our clever CSM) and they can login that way. So, if I understand correctly, if I enable the Google LTI for my school, no one can login with Google any more as I'm assuming the Google authentication option and the LTI cannot run alongside each other. Instead we will have to revert to the standard Canvas login functionality, but we then get all the cool new Google integration with the LTI. If you've already enabled Google authentication, you're all set. Awesome. So why am I not seeing the Google Drive button on the sidebar, or the Google Drive icon in the Rich Content Editor, or the Google Drive icon in the assignment file upload area? Do I need to turn something else on? You need both. The clarification is just saying that the authentication is completely separate from the LTI app. You can certainly have both running, but using the LTI does not enable google authentication. You'll need to install this app, but it won't change anything with how you currently have your authentication set up. Institutions outside the US need to contact their CSM to get the credentials to set up the integration. The link in the EduAppCenter is only for US-based institutions. Your CSM can help you get it ready to go. Do you know of anyone outside of US using the Google LTI successfully? Yes, Google is being used outside the United States. To use the LTI outside the United States, credentials have to be configured by a Canvas Customer Success Manager. The configuration information in the Edu App Center is only for institutions within the United States. This is a major upgrade! Thank you! In the K-12 arena the ability to add Google Drive files from the rich text editor and the modules area is incredible. The cloud assignments is so close to being exactly what so many teachers/students need. Right now it seems to submit the file as a PDF rather than the original Google document. This means a teacher views it through the box.com viewer in Speedgrader. Is there any way for this feature to be configured in a way that allows teachers to actually comment and annotate on the students' work if they use the cloud assignments feature? It would be awesome if this feature enabled the Speedgrader entry to look just like it does when students submit Google Docs through "Website URL." The collaborations feature is super valuable as well, and being able to add a variety of Google Apps file types is a major improvement. Thank you! For this feature, I'm hoping it will be possible someday to choose a template from a teacher's Google Drive to assign to groups rather than always being a blank document. Still a very valuable update and hopefully getting even closer to something teachers will use very widely. Yup, I just noticed as well that SpeedGrader is pulling in documents as PDFs and alerted the team. They'll check that out on Monday. The PDF behavior will be resolved as part of our upcoming Canvas release on January 28. The functionality is in beta, but Crocodoc is not available for testing in the beta environment. It looks like embedded Presentations cannot display presentation view. You can see the slides and edit them, but if you click on Present, it just shows a black box where the slides should be. I'm seeing the same behavior when I embed a presentation. This is great, something my faculty has been asking for. I enabled the LTI for our school, added the necessary authentication information and now the Google Drive appears in the navigation menu. It is also available as an external tool in Modules. But an icon is not showing in the Rich Content editor. What needs to be done to get this to happen? I am having the same problem. I added the LTI to a single course to test it out and see Google Drive in the Course Navigation, but not in the Rich Content Editor. I did authorize Drive as well. Did you figure anything out? I just added the Google LTI to our "test" environment yesterday, and I can see the Google Drive option in the RCE. I needed to click on the blue "V" arrow because I've already got several other LTI apps added to our Canvas instance. It's my understanding that only the first two LTIs that are installed/added will get put on the horizontal menu, and then all additional LTIs will get added in the drop-down menu in the order that they were added to your account/course. So in our case, YouTube and Khan Academy were added first, then Vimeo, TED Ed, etc. I see it now. I looked there at first and either was not patient enough for it to sync up or didn't scroll down far enough. Thanks for your help! My wishlist regarding this: I wish there was a way we could indicate which two LTI's we want on the toolbar for either the full account, or course. Because one of the first LTI's we installed in our account was for Math and obviously that's not the popular LTI needed for everyone. But I can't uninstall everything and go in order because that will mess up the active courses. It was suggested in late 2015, but the needed votes just weren't there. "Authorization failed. Please click "Authorize" to try again. You need to authorize this integration in order to use it. Please sign in to your Google account and authorize this integration"
When I log into my email I don't see any notification or place to authorize Canvas from accessing my Google Drive. Does anyone know what to do from here? Did you try it in "incognito mode?" If it works, it might mean that you are logged in to multiple gmail accounts and the login credentials are conflicting with each other. That was my issue. When I logged out of all gmail accounts and tried it again, it worked for me. it was a little bit of a different issue, but your suggestion helped me figure out the cause, and voila! I can't seem to find the shared shared secret and consumer key to turn on the LTI integration. I am the admin, what am I missing? You'll need to generate your own. HERE IS THE LINK to generate this information. It comes from the EduAppCenter. I put this in at the sub-account level to test integration at a few schools. It seems to be working for everyone who has tried it so far. What an amazing birthday present to find!! Yes!! So I'm immediately jumping online now that I'm home from a trip and getting this rolling. However, here's the first hiccup. I set up the LTI as the Admin and I went to Google Drive in a course and authorized the login. Except it pulled my personal google login, not my school one. So I've done everything from deleting the LTI in my user settings, logging out and back in, using a different browser to authorize the login, clearing cache, and even deleted the account level LTI app as Admin and added it back in. Still pulling all of my personal google drive folders and files. Thoughts? We've had some problems with Google remembering any account you may have used with it previously. So try deauthorizing Canvas from your google account. Please let us know if that doesn't work. Have you tried removing the integration from your user settings page? It shows up in the list of approved integrations. Delete it and then try to authenticate again. The team is working on a ticket to help switching accounts more easily in the future. There are two behaviors I'm noticing when searching for Google Drive documents in the rich text editor. One is that I cannot find some documents when they are placed into a folder if I use the search function. In the screenshot below, I can find the document using search so long as it is in my main Google Drive directory. However, if I place it into a folder in Google Drive, it no longer appears in the search. The second behavior is that the search does not seem to yield an easily-discernible organization. For example, my most recently created document that I edited most recently is at the bottom of all my search results rather than being near the top. I'm wondering if there is a way to configure this to have most recent near the top of the search results. I've added some clarifying information in the release notes related to your questions. The Search feature only locates files within the folder being viewed, and files are displayed in alphabetical order. A few times I've received a failed authorization warning when logging is as a student; the initial authorization workflow for students is a bit awkward, sometimes requiring them to authorize multiple times before being able to interact with the Goggle Drive content. The Drive Cloud Assignments creates a copy of the drive document (doc, sheet, or presentation) for each student assignment attempt. These actually show up in the student's Drive. They can edit them there, but those changes are not reflected in the submission the instructor sees in the Speedgrader. This is probably a good thing, but an opportunity for some confusion. The Google Drive link in the navigation doesn't allow you to share specific resources, so you essentially just get an embedded view of your drive folders. This provides a useful shortcut, but I think most instructors would expect that they could share existing content through this link. I think this is a great first attempt with just a few issues to iron out. What a useful addition to the Canvas ecosystem! I'm curious if we could get a bit more detail on the possibility of the LTI playing well with institutional single sign-on with Google. If it's technically possible, might it be on the roadmap at some point? Similarly, what are the risks of mixing the Google authentication with single sign-on? I imagine this might allow someone to connect a personal Google account, which could create some access issues. Thanks John Thomson for sharing your comment. Nothing on the roadmap at this time to connect the SSO and the LTI app. This integration is a Public Beta, we'll listen to feedback from customers and from there determine if and what we will further develop. Comments and feedback are supper appreciated as that helps up make that call. Perhaps others in the community might weigh in regarding mixing Canvas Google authentication with institutional SSO. I am confident that UW-Madison would appreciate this. One suggestion: it would be great if the procedure for embedding a Google file (via the rich text editor) gave an option of whether you wanted the embed to include the Google toolbar (as it does now) or if you wanted it to show only the document without any of the Google doc tools. Jim Julius this would be perfect! It would also remedy the issue with embedded Slides not presenting, which if your are embedding a slide, you will most likely want it in presentation view anyway. For cloud assignments, is there any way to add a rubric as well? Normally this would be added by returning to the assignment page after publishing, but that option is not there. Cloud assignments are created by loading a document through an external tools. In Canvas, all external tools require you to add the rubric before you change the assignment type to an external tool and save the assignment. That does help, although it does feel a bit clunky. I saw before that you were passing along the pdf issue. We have been trying some internal testing before passing this along to the rest of our school, and with cloud assignments, I keep getting errors that the file could not be converted and to download it. When I try downloading it, I get an xml error page about a missing key. Could that be connected to the pdf issue? I added additional clarification about rubrics in the release notes. The rubric doesn't actually display on the page, but students can access it in the assignment details page (through their Grades page). The PDF issue is resolved in the beta environment, so you're welcome to test it there and see if those errors are still related. Unfortunately if you're specifically trying to test Crocodoc, Crocodoc isn't available in the beta environment. I would really like to see rubrics visible on the cloud assignment itself in the future, perhaps as a "view rubric" button at the bottom of the embedded Google Drive assignment page. Also, allowing users to add and edit a rubric from the assignment settings page seems like it would make sense. Right now, I'm afraid rubrics in cloud assignments are going to confuse a lot of users (and students especially). The Google Apps cloud assignments are created using an external tool, and currently external tools do not support rubrics directly. So any external tool created as an assignment mimics the same behavior. Adjustment to that overall functionality of external tools and rubrics would have to be addressed by our product and engineering teams. I have enabled new Google Apps integration via LTI and I see the Google Drive icon on my left hand menu, and I am authenticated, but I do not see the Drive icon in the Rich Content Editor. Is there any step I need to do? Hmm... it showed up automatically for me, nothing extra required. Maya, it showed up automatically for me as well; I had to click on the dropdown V to find it, and if you have a lot of other integrations already present in the RCE ribbon, you probably will as well. I found it. Thank you! Now do you know any more about the "Cloud Assignments" that create copies of a Google Doc automatically for students? I couldn't see how to do that right away. When you create the assignment, the submission type should be external tool and a menu will come up for a cloud assignment. What I found out is that if you want a rubric, you need to create the assignment, attach the rubric, and then edit to create the external tool. If you're wondering how to create a cloud assignment, that lesson is part of the Google Drive documentation. If you're wondering how to make copies for each student, Canvas does that automatically when students open the assignment. I've only played around with it, but it looks like you need to add the assignment and then for "Assignment Type" pick "External Tool." This should prompt you to then pick something (click the "Find" button) and then you can select "Google Docs Cloud Assignment." From there your Google Drive should show up and you should be able to pick the document you want to use as the Assignment template. I've learned that only the first two "apps" you add will have icons in the Rich Content Editor... after that, they're available in the "downward triangle" pull-down menu. Are you seeing it there? - The "open in a new window" feature doesn't work for students, if checked. A new tab opens up, with the spinning wheel, but it doesn't load. (This has been reported to the the development team). - More significant has been the visibility in SpeedGrader. When trying to view student submissions of documents, our experience varies from "works great!" to "I get the spinning Panda icon only" to "nothing happens". Is anyone else experiencing issues with loading student submissions? The "Open in a new window" feature is the issue I have encountered while testing this out with some teachers. This feature is vital, as we do not want students to "cover-up" Canvas in order to complete the work using the Google app. Once this issue is fixed, we might be on our way to something pretty great! Any word on whether admins/teachers will need to change any other settings? "Allow external collaboration tools" or "Disable Google Drive as a Registered Service"?? Both settings would have to be set as enabled or disabled by an admin. The collaboration tools feature option can potentially be turned on or off by instructors. Pros and cons are listed in the release notes. I assigned an assignment using google docs to my students using the external tool. I made sure they were all authorized and were able to open and see the document in Canvas. This evening, one student was able to submit the assignment. I have had four others message me that after hitting submit, the wheel just keeps spinning. Looking in Speed Grader, I see only the one submission. Anyone else having issues with submissions from students? The students are finding that if they close Canvas and submit again, they are successful. Also, my "Approved Integrations" section shows that my token will expire shortly. Can I assume that when it does, I will be able to get a new token and then edit the expiration date? The team told me that Canvas is using refresh tokens, so even though the expiration date seems rather short, the authorization will still work unless you remove the integration manually from the page. Current collaborations disappear — for me, no biggie, since the current collaborations were not great. No Peer review/grading for Google docs. You can have students submit via Google docs ("use External Tool" setting), but if you want students to peer review the submission, the assignments must be uploaded (not using the Google "Submit" button). So, students still need to download their Google Doc and re-upload it (as PDF or whatever) for peer grading. This is not great. It doesn't show Shared files unless you've added them to your Drive. Any thoughts, concerns, solutions I've missed, workarounds? I've added some clarifying information to the release notes regarding some of your observations. Hopefully they help explain a bit more about the functionality. Current collaborations only disappear if you enable the new feature option, and for Google Doc, I think you may be referring to the Google Doc tab, which is part of the Google Drive web service and is not part of the LTI. Explanations between the two are mentioned in the notes. Additionally, peer reviews are not supported in any Canvas external tool. Can you provide any clarification? It means that existing collaborations can no longer be accessed through Canvas. However, once a collaboration is shared with a user, the collaboration can always be accessed through Google Drive. So users could still access the collaborations in their Google Drive; they just wouldn't be able to get there through Canvas anymore. So if you're in the middle of a course that is actively using a collaboration, you probably wouldn't want to enable that feature option until you are finished with the course, or at least until you are ready to discontinue access to any previous collaborations directly through Canvas. Our team just updated the Google LTI so that now you can use the search function to locate any file in your My Drive folder, not just within the folder you are currently viewing. In my own testing (in our "Test" environment), I set up the Google LTI app at the Account level. The "Google Drive" menu was added inside my sandbox course. I went to my course "Settings" >> "Navigation" tab to hide the "Google Drive" button from Student View. After I hid the "Google Drive" button and saved changes, the "Google Drive" button completely disppeared not only from the Student View but also from the Teacher view as well (I was expecting "Google Drive" to just be grayed out on the left nav bar). The reason for trying to hide "Google Drive" from the menu was because I was not sure what benefit "Google Drive" has for students from this view (though I know the benefits of the LTI in other areas of a Canvas course)...other than to authenticate into Google and see a listing of their files (though I'd welcome use cases that I'm not aware of). Shouldn't the "Google Drive" button be shown but grayed out on the course navigation if hidden? I'm conflicted about having that "Google Drive" link in the course nav as well. I installed the LTI at the account level, so it automatically went into all our course menus as enabled. Adding one more thing to our course menus is a BIG deal for some. Given it's limited functionality (interface, search problems and no sharing options) I question the value of having it there by default. So I deleted the app then reinstalled it manually using the "Paste XML" method. I added a line to make the course navigation link disabled or hidden by default. This will allow the teacher to add it if they would like, and not get in the way of those who don't want it in their course nav. Here's a Google Doc of the code example. Thanks for the link, Chris Long! Tangent: I also found the same behavior to be the case for the Canvas Release: Microsoft Office 365 LTI. It depends on the type and purpose for the Course Navigation link. Links that are still visible for instructors are links that usually directly relate to course content. In this case, the link is designed for individual use, so it's configured to be disabled and not display in Course Navigation for any user if hidden. So the link is functioning as designed. But it looks like you figured out a nice compromise. We've also deployed a fix for cloud assignments in SpeedGrader in beta, which enables them to work with Crocodoc again. However, Crocodoc is not available in the beta environment for testing. Several of you have noted how you would like to see additional features in this integration. The Google Apps LTI implemented key components across several Canvas areas; although there are always additional features that could always be added, our product team creates initial solutions that meet the core needs of our customers. As like any other Canvas feature, additional changes are based on feedback and product use. The feature idea process is part of our The specified item was not found. space. As for noted contrary behaviors, we recommend submitting cases to our Canvas support team (if not already reported). Although others do appreciate notice of inconsistencies here, Support cases are what help get behaviors reviewed and corrected. Additionally, support cases capture your course and account information and credentials, which are much more helpful in troubleshooting. It would be great if when you embed a picture from Google Drive that the dimensions of the picture were the same as the picture. Right now, the import has gray bars on either side of the photo. I've tried setting this up in both my test instance and real instance, and I'm running into a problem. I've added the app configuration just fine through the admin settings, but when I go into a course and try to authorize it, I keep getting this message: "Authorization failed. Please click 'Authorize' to try again." Any ideas on how to fix this? This brings up a good point. If students or staff have a similar issue, can Canvas support assist? Are there some recommended fixes we can have our people try? I assume the first step would be to login to their Google account outside of Canvas to ensure the login is correct. After that, however, call Canvas support? I've seen discussions about this and Canvas support is trying to find the source of the problem. First try and see if you can log in using an incognito window; if you can, the credentials may be misconfigured. If not, let our support team know so they can continue to investigate. I tried logging in using an incognito window, and it worked! Now, because this worked, you said the "credentials may be misconfigured." Does this mean something with Canvas or the Google Apps LTI is still not working right? Or is the problem on my end? It may be a conflict such as being logged into another Google app. Incognito windows don't have any existing login data so it shows that the configuration is working. So perhaps in your non-incognito window, compare your active logins in Google and see if one conflicts with another. You were right...I was logged in with another gmail account. I logged out of all accounts and then tried it in my test instance, and it worked! Thanks for your help. I'm having this issue, too. It's very confusing! After adding the Google Apps, I started to test to make sure all would go well. The problem I'm running into is if a student is trying to connect to a collaboration with a google doc, they try to login with one of there google accounts and it doesn't work, their connection is broken. They don't get an option to re-authenticate it just fails. They can never connect to that document. logging out and logging back into Canvas doesn't help. There is no way to repair it, or back out. Are others running into this same issue? Any suggestions? I've sense removed Google Apps until we can get this under control. I'd recommend contacting Canvas support to have them look into this for you. I was having the same issue your students have, but with the help from others here was able to figure out the cause. It has to do with Registered Services. In my case, I had registered one of my Google Drive accounts, but when I turned on the LTI I wanted to use a different account. This resulted in those log in errors your students are getting. The fix is pretty simple (lots of little steps, but very simple). First make sure you (they) are logged out completely of all Google accounts. Go to: Account > Profile > Edit Profile > Manage Registered Services > Locate the Google Drive logo and hover above it > a “delete” icon (a red circle with an X) will appear > click the icon to delete the current Google account that is registered > then re-register Google Drive with the correct account by clicking the Google Drive icon in the “Other Services” column. After this go back to create an activity and choose Google Drive from the editor, or click the link in the Course Navigation Column (you may or may not have it in both places depending on the permissions you gave the LTI when you set it up). Once you type your credentials and authenticate you’ll see the contents of your Google Drive start to load in an iFrame. Does anyone know if having a different Google domain for students and teachers would interfere with adding this new app to their accounts? Thank you! I've done everything I know to do, but we are currently seeing an error message whenever we try to use the "collaborations" feature. We disabled the old Google Drive registered service. Anyone else ever see this? Any ideas? I was initially having some issues using the Chrome browser (the one that should work), but testing other browsers I found that it worked. Have you tested using other browsers and/or devices? Make sure you installed the LTI in the right sub-account (if you are using sub-accounts). Then, make sure you are logged out completely of all Google accounts. Thanks Ricardo. I tried two other browsers and I get the same thing. We added the LTI at the master account level. Also, we disabled the old Google "registered service" option from our account, so when users go to manage their registered services, Google is not even an option now. This WAS working until today, so I'm not sure why it stopped working. I may try deleting the LTI and re-add it. I'll let folks know here if that works. We are experiencing this same issue and have tried all basic trouble shooting. I have submitted a ticket with Canvas support. Just a note to anyone using the Google Apps LTI. If a student is using a Chromebook and has decided to block third-party cookies, the LTI integration will not work. The student might receive authorization, but because the cookies are blocked, the message will be received that Authorization has failed. Once the third-party cookies are allowed, everything works as advertised - Great! Thanks for your comments on the Google Apps LTI. Included comments here are helpful in helping diagnose any Google account conflicts with the LTI, so thanks to those of you who have included troubleshooting tips. I believe our product team has identified the core contrary behaviors that may still be outstanding on the Canvas side with the integration. Any other contrary behaviors should be addressed to the Canvas support team for investigation. Related to feature requests for the LTI, any additional functionality needs will be reviewed by our product team based on the use of the tool. Any further updates related to the Google Apps LTI will be included in the Release Notes. Re: Making links within an embedded google document open in a new tab by default?